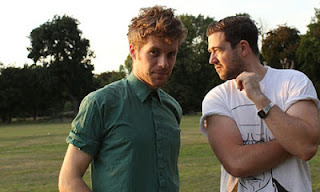 When London outfit Thumpers first came into my view about a year ago, it was 'Sound Of Screams' that thoroughly enraptured with its experimental dream pop. The track finally gets a well-deserved single release this October, have a listen to the joyously revamped 2013 recording below. The new version clears up the audio a little, although some of the lyrics continue to flummox. But 'Sound Of Screams' is one of those songs that you'll sing along to regardless of your knowledge of the actual lyrics. The news of this single looks set to cap an impressive couple of months for Thumpers with support slots for Everything Everything and CHVRCHES on the way. Have a cheeky listen to the demo that kicked it all off in the YouTube embed below but savour the new Soundcloud version. Find more info at thumpers.co.